Can you make this into a poster? By poster, what do you have in mind? Actually print and sell or give it? If you wanted to take it to a print shop, it probably has the resolution to stretch to poster size. The Jon Gary Williams chart can be especially valuable to new Christians, to teens, or to anyone who has not seen the chronological context and flow of Scriptures. While Bible events remain like random puzzle pieces scattered around our minds, they cannot yet fully endow us with their deepest enlightenment and power. The church needs to SEE the HOW, WHEN, WHERE, and WHY each Bible event either looks forward to Christ or points back to Christ. His death, burial, and resurrection are to be our foundation, our focus, plus our reason for all we want to learn and do and be. With the William’s chart in mind, consider that it was our timeless Sovereign who invented time. Furthermore, our Creator loves to say, “In the beginning . . .” and “It is finished” (Genesis 1:1; John 1:1, 19:30) because He knows that we humans need chronology! I am so proud of this chart. Glenda, did you put it together? No. I’ve not seen this one before. Was thinking of printing it out on half page paper and inserting in the bulletin for Sunday so everyone could have it. Gotcha. Would be a good way to share it. 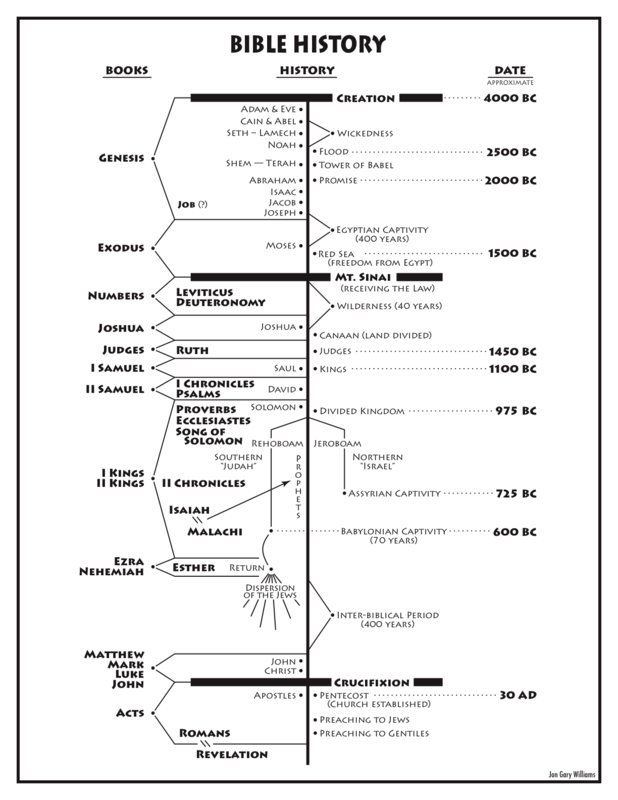 The site includes the Bible history chart, along with many other handy charts and informative articles. It’s a great all around resource! Wonderful chart , it is very useful for my studies.